It's surprising how "El Presidente" touts itself to be a historical biopic about our first President, Emilio Aguinaldo. Surprising because sadly, it feels more make believe than real and it is far from being significant or monumental in any way, shape or form. It is hard to see how the epic fight scenes could have happened the way they did. We get that the "300" vibe makes it all cool-looking and all but a dual-wield pistol shooting Aguinaldo is appalling to say the least. And Aguinaldo seeing "ghostly"-forms and being fortune-told about his life in the first fifteen minutes (and actually giving the whole plot away in the process) doesn't help its plight. Honestly, "El Presidente" seems more like "Abraham Lincoln: Vampire Hunter" than "Lincoln". And unfortunately, that's only the tip of the iceberg. Put simply, this whole film is a mess. Definitely not worthy of Aguinaldo's legacy, not worthy of any historical acclaim and not even worthy of a watch. This is the worst we have seen from the 2012 MMFF - seriously. The story starts as President Emilio Aguinaldo (E.R. Ejercito) is captured by the Americans in Palanan. The film then transitions 15 years earlier, in 1886, as a young Emilio Aguinaldo is foretold his life by an old, mysterious lady. He discovers that he will have three significant women in his life - one of which he will never marry, his close friend Candido (Ronnie Lazaro) will be killed by a bullet and afterwards, Aguinaldo will become king of a kingdom he will never rule. The movie then chronicles Aguinaldo's rise and fall from 1896 onwards. 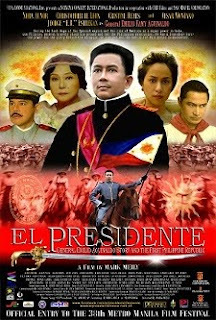 "El Presidente's" two assets is its cinematography and budget. Two things that may make the movie seem better than your regular film but it actually isn't. All the visual flair may slightly mask the rotten nature of "El Presidente" but it won't stop its self-destruction from happening. A self-destruction fated by choices that baffle. Like the battle scenes that are indeed epic but never really feeling real as we mentioned earlier. Or the illogically written plot that not only inserts supernatural elements to a supposedly historical film but it also forgets to tell the significance of battles and events taking place. Now this could be because of the dull, lifeless and meaningless acting by its lead, E.R. Ejercito who had a hard time making his lines understandable but worse, facial expressions that don't seem to come out right for the appropriate scene (he also cries and cries countless times during the movie but nary a tear comes out). E.R. Ejercito just did the worst acting job for both male and female actors in years. Another thing is the casting job. What's up with the numerous cameos by comedians wearing obviously fake moustaches? Every single scene that these comedians came out, the crowd laughed. We couldn't tell if it was because of association, the moustache or both. And don't get us started with Nora Aunor looking way older than her aunt, E.R. Ejercito as Emilio Aguinaldo in his mid-Twenties, Cristine Reyes and Sid Lucero having one-worded dialogues only twice or thrice during the whole film and Will Devaughn as a conyo-speaking Katipunero. "El Presidente" is a monumental disaster and one of the worst films we have seen in years. It's running time is almost 3 hours. 3 hours that anyone could have spent being a productive Filipino. A time, we are pretty sure, that the real Emilio Aguinaldo (and all our other heroes) would rather you spend somewhere or anywhere else.